One dusky evening in Orange County, California. Filmed on the San Clemente Pier. Read my 9 Cool Things to Do in SoCal or see my 18 Photos That Will Make You Pack for California. If you like this film, give it a thumbs up or share! Follow me on Vimeo or subscribe on YouTube. What’s your favorite beach pier? What a beautiful place. And great video. i love the colours the sun gives off when it is starting to set, when day is turning to night. Also, the blue waves coming in over the beach. beautiful! Cool. Exactly what I was going for! Simply flawless. Just beautiful in the shooting, music and editing. I have no idea how long this took from start to finish but the finished product is so polished and effective. The colors, mood, and images just makes me want to be there, experiencing this wonderful place now. It is a tribute to you and your talent. What a thoughtful comment, Nicole. Thanks! Beautiful video as always! Your editing is so smooth. I loved the dissonance in the music here. It gave the video a very dramatic feel. This is so professional! Did you use a drone for the birdseye shots? I have to echo what everyone’s already said – definitely getting thriller film-type vibes from the music! How funny! Yours is probably an older village than in OC. Looks beautiful – will definitely need to go here for sure. I’m down in Orange County two weekends out of every month and I’m always looking for new places to explore down there. Oh wow. I hope you enjoy San Clemente. Nice little beach town. Such a beautiful video with some great footage. 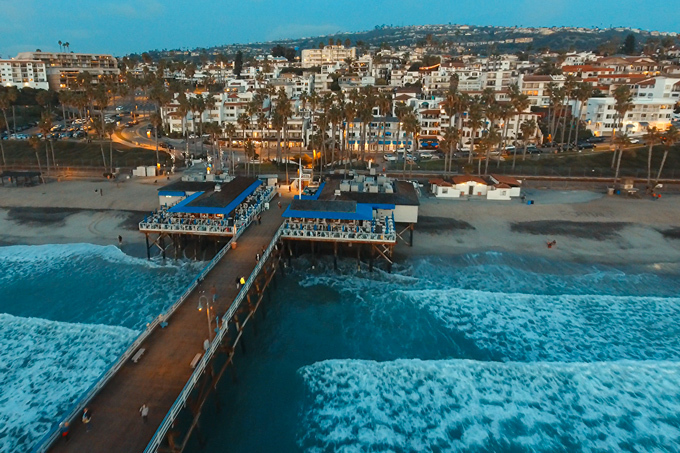 The sun setting over the San Clemente Pier made for the perfect background for the local caught on film. The music made it seem so suspenseful idea for a landscape shot in a movie. Thanks for sharing. Your videography is impressive! Love how the golden light shines on the city. The landscapes are amazing! Really nice editing and composition. I love the drone scenes. ^_^ I can’t wait to travel again. I wish I wish in socal! The best pier around me is Pier 39 in San Francisco. However, I actually love Pier 14, which is closer to “South Beach” in the city. Glorious view of the bay and the Bay Bridge! Cool. I haven’t been to SF for a decade. Would love to return! I would love to visit this pier!! Love the video and hope to see it in person soon!! Yet another great video of yours! Totally love the scenes and the colour grading! Keep them coming, they are great to watch!